GM will sell the Opel/Vauxhall Ampera, a rebadged Chevrolet Volt, across mainland Europe starting in the fourth quarter of 2011. UK car buyers will be able to purchase the Ampera plug-in hybrid for 28,995 pounds (about $46,000), General Motors Co.'s Vauxhall unit said, after a 5,000 pound discount offered by the UK government to buyers of the electric cars. The Ampera is a rebadged version of the Chevrolet Volt. In European markets outside the UK, the Ampera will be sold as an Opel and will cost 42,900 euros ($57,739). The Chevrolet Volt costs $41,000 in the United States. 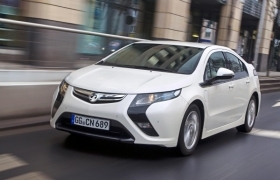 Ampera sales will start across mainland Europe in the fourth quarter of 2011. Vauxhall said it has started taking reservations for the Ampera and UK deliveries will begin in early 2012. The Ampera is designed to be powered by electricity at all times. For the first 25 miles to 50 miles (40km to 80km), power for the drivetrain comes from electricity stored in the 16-kilowatt hour lithium ion battery pack, resulting in zero emissions. For longer trips a gasoline-fueled engine/generator sustains the battery charge and extends the driving range to 300 miles. Vauxhall said the Ampera is likely to be driven in battery mode nearly all the time because the battery can be re-charged quickly in about three hours from a standard electricity outlet and research shows the electric drive range exceeds the UK's average commuting distance. GM's European unit has said it will not offer buyers the opportunity to purchase the Ampera at a lower cost while leasing the car's expensive battery pack, a retail model that some other automakers are using to bring the sticker prices of their EVs in line with conventionally powered cars. "Leasing the battery pack makes an EV's price appear attractive because the battery leasing rate is not highlighted but battery leases are paid monthly for several years, so the total cost is roughly the same as a car whose total price includes both the car and the battery," GM said.